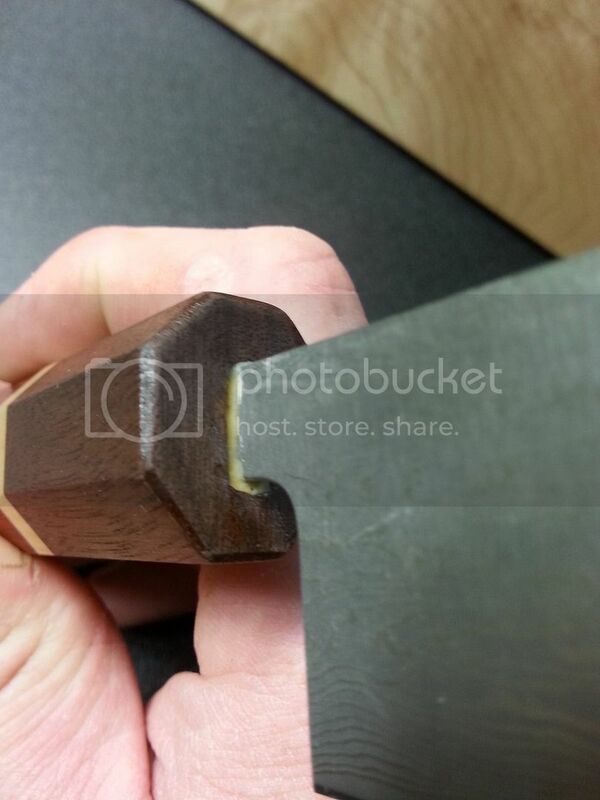 Maker of Custom, Hand Crafted Knife Blocks & Creative Storage, Wa Handles, and Cutting Boards. This knife belongs to GeorgeK, and he wanted the handle replaced as the original was slightly offset/crooked, and he didn't care for the feel of it regardless. 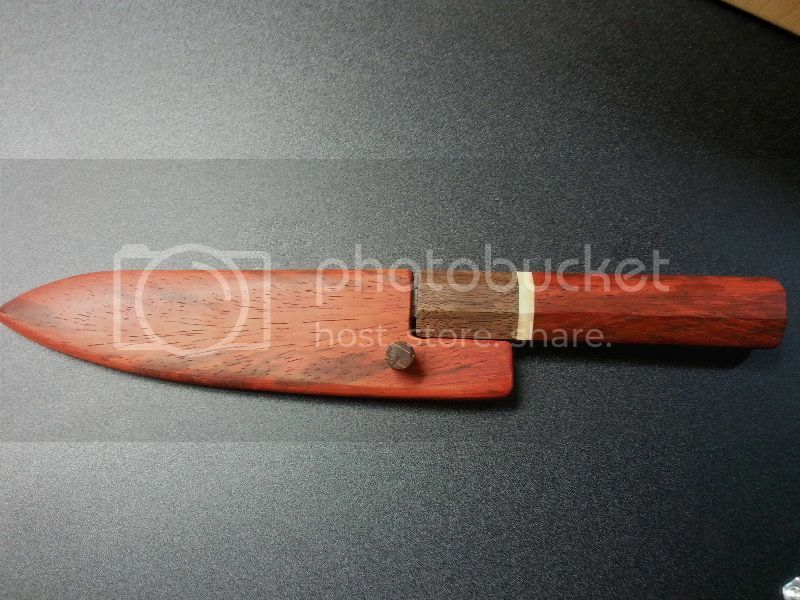 This was my first use of Padauk, and I was not a huge fan of it to be completely honest. Like Wenge, the grain is very open and difficult to close. The dust from the Padauk was also an issue. It was very clingy and stuff to everything. The ground under where I cut the wood a week ago.. it still red from the saw dust. The t-shirt I was wearing has a faint stain in it and I'm almost certain it's from the wood. It machined well, and sanded well.. except for the open pores not closing. 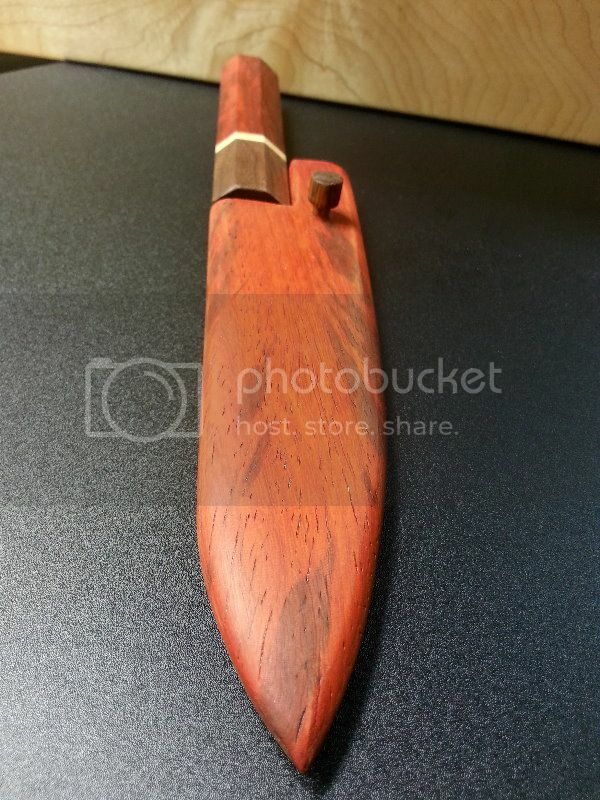 The curly maple spacer was also a victim to the red in the Padauk. The handle dimensions are duplicated from the factory handle. "Price is what you pay. Value is what you get!" I really love you style and work. 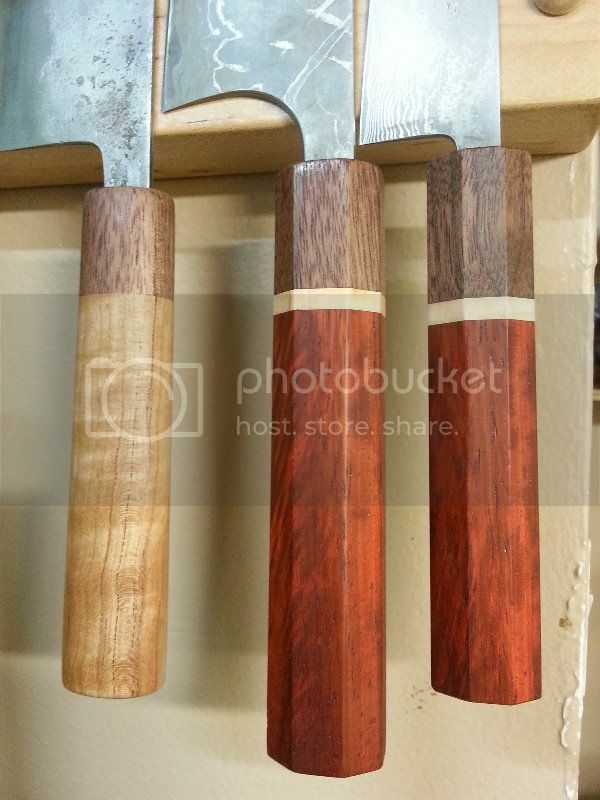 As an aspiring knife handle maker I have been drooling over the level of skill that goes into each of these handles. I have studied all your posts! I have little to hide, and not many secrets. Feel free to shoot me a PM if you have any questions. I just added a fresh coat of tung oil on the handle 4 days ago and gave it some light sanding with 2,000 grit sandpaper. it holds amazingly well, and the color is even more appealing after a year or so of use! 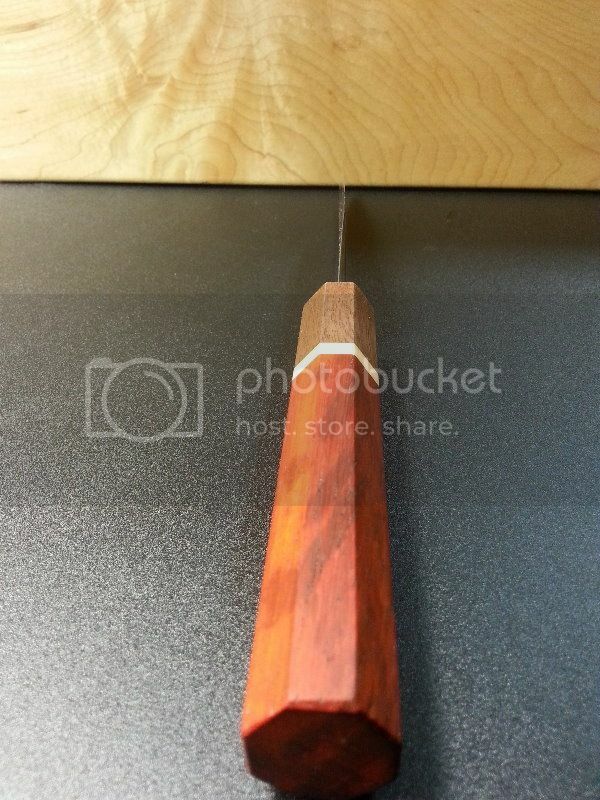 What is not to love on Padauk? Amazing! I got you another piece of red wood to make a mess, "Red Coolibah Burl"
Yup, looks great of course! I love the look of padauk but it's Cheetos wood to me for the dust and color that gets everywhere! I've sealed the grain with wet sanded tung oil varnish (Watco brand), but I think it would look better with a clear grain sealer like Birchwood Casey brand pore filler vs the wet sanded fill. 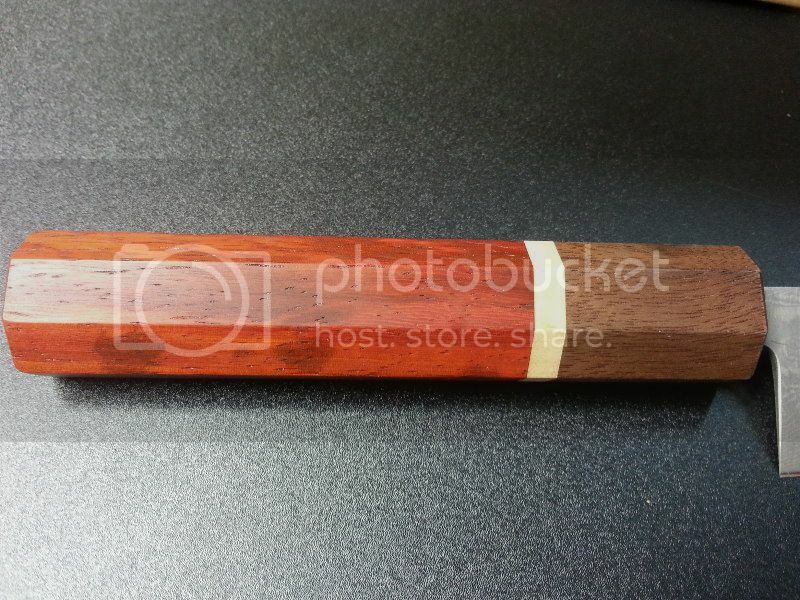 Do you find the Padauk colour stains your hands or bleeds at all? No, but that couple be partly do to the six (or more) coats of tung oil I applied to it. George would be the better person to answer maybe, as he's the one who uses it... but I didn't have any issues with it once the tung oil went on. It is the dirtiest wood I've ever worked with. It dyed the maple spacers that is next to it red, the bench and my hands were red. Simply, it was a mess. George likes it, so all worth it.